When Hewlett-Packard release a new printer, many people get excited and annoyed in equal measure as it usually means that the printer they own has become obsolete, yet again! Well, before you trash your existing set up in favour of the HP PSC 2355v, here is a brief review of its finer points which should help you to make and executive decision, rather than going nuts and simply heading off to your local retailer with your savings in your hand. The HP PSC 2355v is actually rather attractive in a purely cosmetic sense. The colour scheme, a delightful silver/charcoal affair is rather eye catching and in practical design terms, the HP PSC 2355v doesn't lose any marks for its attractive finish. A handily placed user interface has been very smartly attached to the case of the HP PSC 2355v, much like those printers in the HP Photosmart range. Print outs made with the HP PSC 2355v are hugely effective. We would be lying if we said that the HP PSC 2355v isn't a quality item, but it does have some limitations. However, the sheer quality of the produce is worthy of note and colour images are very pleasing to eye in particular. Cost might be an issue in truth, as this is not what you might term a budget model. 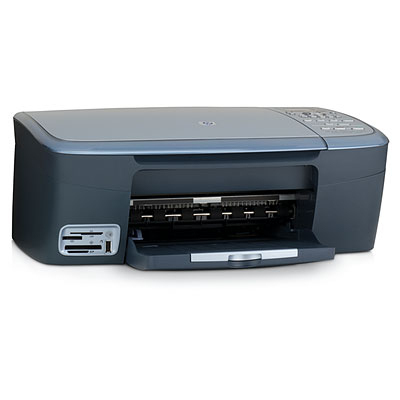 However, the HP PSC 2355v does boast a price tag which fits it's potential. If you are after a high quality machine and don't mind paying for it, the HP PSC 2355v might well fit the bill.